Going to the theater is probably not an automatic choice for most families when it comes to entertainment. I am referring to live theater where stage plays and musical performances are held like ballet and singing concerts. Our family loves to go to the movie theater like most people do but we have recently discovered the joy of experiencing the arts in live theater performances. As it appears, we are just starting. Watching these performances were not actually intentional at first. I would be invited every now and then to watch such shows and write about them. The offer would usually be for two so I got the chance to bring any member of the family, whoever is available or whoever I think the show is more suitable for. Then I found out, we actually enjoy doing it especially if we are complete. 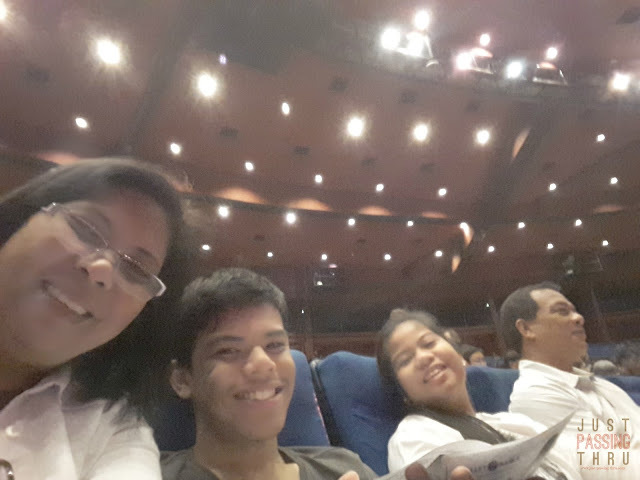 Let me share with you the benefits we derived form going to the theater as a family. Without a hint of snobbishness running in our middle-class blood, it is with great pleasure that I say that we are steadily developing a deeper interest in the arts. I realized this is very important if I were to give my children a wider choice in developing their preferences. How can I expect them to do that if I do not find a way to expose to them to the varied forms of art available? Exposure encourages them to have the confidence to try if participation in any form of art is something they see for themselves in the near future. They don't even have to make a career out of it. Genuine appreciation can help them arrive at better choices for other aspects in life. "Practice makes perfect", we have heard this saying so many times that we tend to ignore it most of the time. Communication skills can be improved by hearing others use a language correctly, practicing it regularly, and by simply being curious enough to look up any word or expression used in a show that needs further understanding. I think the queries I answer from my children after watching a theater show stays on their mind longer or permanently compared to the review we do based on memorization. This is probably because they can instantly connect the answer to something they have seen. In watching theater shows, everyone is compelled to put attention to what is going on onstage. There is no place for gadgets that are the usual distractions in family time. While eating, we get to talk about the show instead of retreating to our own corners doing our own business. Each member is allowed to express what he/she thinks about it, with no judgment. It's just us judging the shows. We learn, we laugh, and we enjoy as a family. As of now, we are very fortunate to be looking forward to shows put up by companies such as Ballet Manila, Repertory Philippines, and Dulaang UP. In between those shows are sprinklings of varied shows that come our way, each with its own merits. That said, theater is such a fertile ground for family entertainment. You just need to consider age appropriateness specifically for young children to ensure that the family gets to enjoy. My son finally accomplished something he was meaning to do for quite some time now. This is to be a duly recognized member of the Knights of the Altar. I believe he sees it as his way of serving God. My son has always been very conscientious when it comes to matters related to our faith. The remarkable thing is that he actually walks the talk by being a good person even to those who are not very good to him. He always makes himself available for joining outreach programs involving catechism to young children. 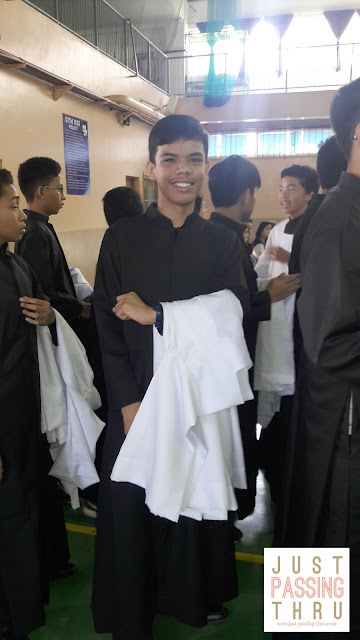 It did not surprise us at all when he informed us that he decided to join the Knights of the Altar (KOA) group in their school. 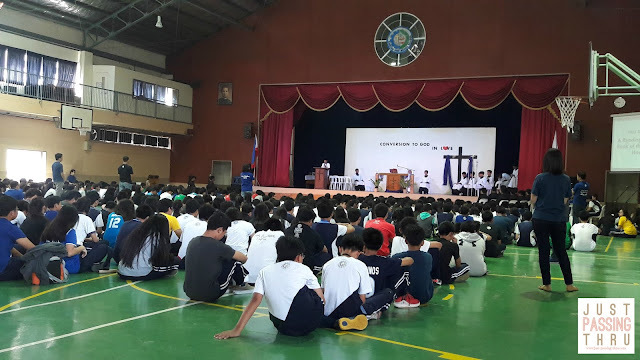 The formal induction of the new members for KOA happened during the First Friday mass for this month in their school. After going through proper formation with regards to instruction on the Mass, its parts and their meaning, several young men, including my son were welcomed to the organization. They are expected to be mature enough to understand their responsibilities and carry them out with appropriate reverence. These young men marched in a procession initially wearing only the black alb. Their respective parents assisted them in donning the white surplice at the appointed time. Not long after that, they were all acknowledged official members of the organization. No one can be happier than my son during that moment. 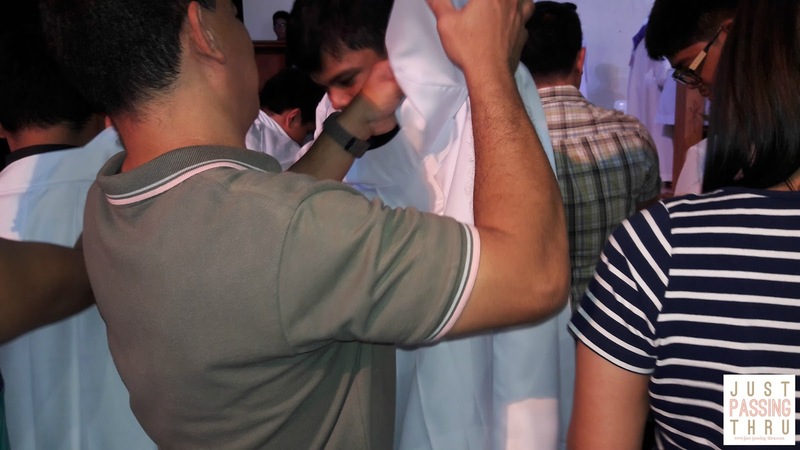 That is why I know he is doing this because he really wants to serve God in his present capacity. As parents, we can only be supportive and thankful that he is choosing the right path for himself. 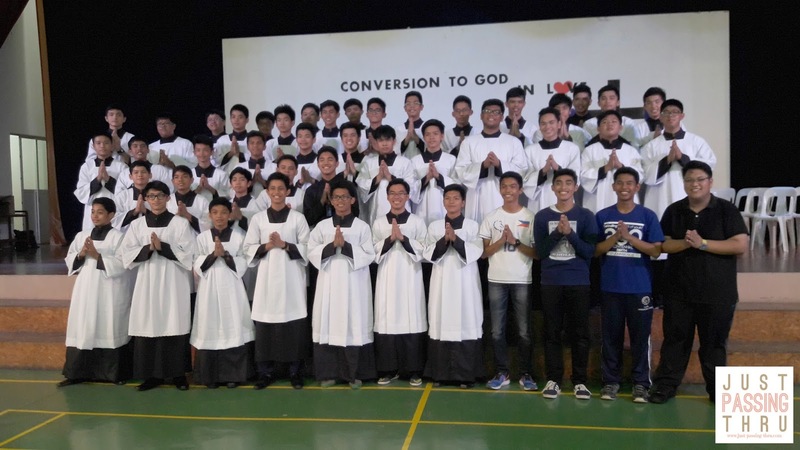 It was actually refreshing seeing young men putting attention to their spiritual formation. Today's time does not make it easy for many of them. That is why this is an occasion of great joy. Altar servers' duties in performing support tasks for the altar such as fetching mass implements as needed by the priest, carrying the cross, and ringing the bell, among others may be viewed as non-essential by some but their presence and participation is considered integral to the celebration of the mass. 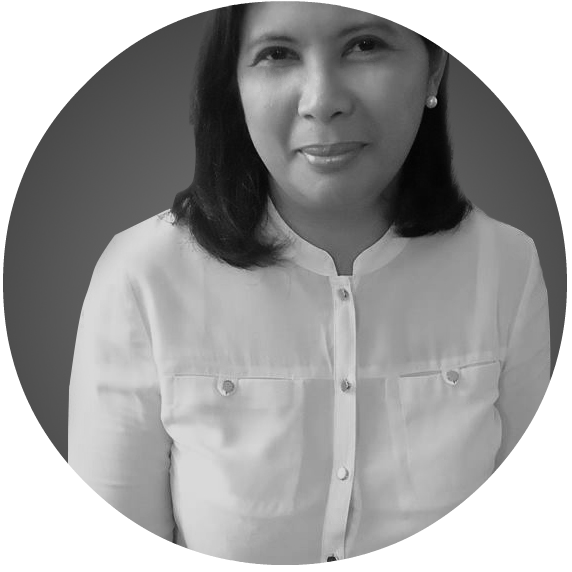 They are expected to be seated where it would be possible for them to easily assist the priest celebrant. 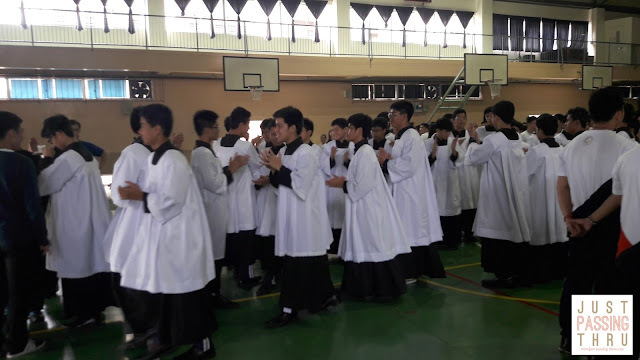 While at least one altar server would suffice for a regular mass, the number is increased depending on the occasion. A lot of my friends upon knowing of this latest milestone in my son's life, has been teasing me that I may yet have a priest for a son. I will let my son and God decide that. All I ask is that he is able to accomplish what he wants, whatever path he chooses to take. Given his very keen interest in voice acting, anything goes for now. 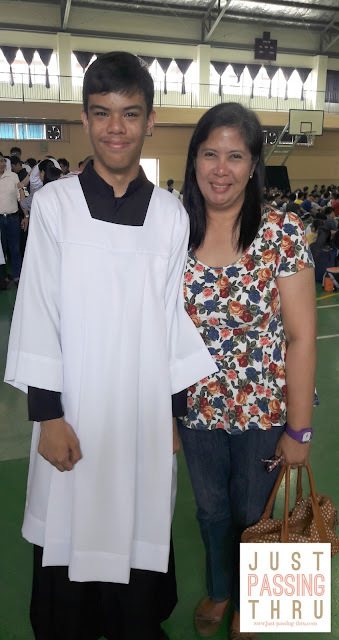 As my son is wont to say, he can always serve God in whatever field he finds himself in. True! That said, for now his innate kindness serves him in good stead.